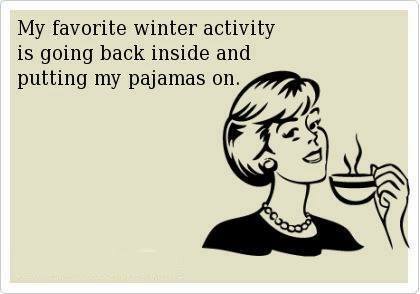 Only to voice my internal screams at winter. Friday, I had enough already when it took me over an hour to get home in the snow & ice. See how dark & dreary? & snowy & cold? & Sitting in this exact spot for 20 minutes? Don't get me wrong... I complain about the heat of summer too... I don't mind winter when it comes to the cold. I just hate the snow & ice when I have to drive somewhere. I completely agree! I love a good snowstorm when I have nowhere to go and can sit on the couch in my jammies with blankets and warm mugs of coffee, hahaha. I despise driving in it. We've had a few messy days here and it's snow again right now! i agree!!! baking & jammies all day! I may live in Minnesota, but I promise you....spring can come at ANY TIME. It's supposed to be -35 tonight with the windchill. Ugh. Ugh. Ugh. Amen Sister!!! This weather could quite possibly bring out the cranky in a girl. YUCK!! I'm with you... it's not the cold that bothers me it's the having to go anywhere (or not being ABLE to go anywhere) because of the snow/ice that bugs me about Winter!